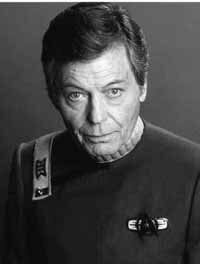 PULP CULTURE column for June 17, 1999: DeForest Kelley, R.I.P. The announcement of DeForest Kelley's death at 79 shouldn't have been a surprise when it crackled from the radio as I drove home from work last Friday. As numerous stand-up comics had noted, Kelley had looked like his character's nickname, "Bones," for years. And, as the oldest of the original "Star Trek" cast members, Kelley was the logical choice to be the first to go, as a certain pointy-eared Vulcan might observe. If James T. Kirk was the will of "Star Trek" and Mr. Spock was its brain, Dr. Leonard "Bones" McCoy, as portrayed by Kelley, was certainly Trek's soul. As McCoy often complained when faced with some dreaded interstellar plague, he was simply an old country doctor, not a miracle worker or magician or engineer. Yet Dr. McCoy always got the job done. As others have said before, if you add Kirk, Spock and McCoy together, you get one complete human being. What makes "Star Trek" feel like "Star Trek" is the interaction of its three lead characters. Spock and McCoy bounce every episode's ethical dilemma between each other until Kirk finally snatches the ball away and charges the basket. Options are weighed, values considered and actions taken. What goes on in every individual's mind during a time of decision takes place instead among three separate people and becomes a drama for everyone to see. The Kirk/Spock/McCoy triumvirate was a winning formula for Gene Roddenberry, and I remain perplexed as to why he discarded it with "Star Trek: The Next Generation," opting instead for a conflict-free USS Enterprise. There is little drama when everyone on the ship thinks alike. While he was never as popular as Kirk and Spock, it's impossible to imagine "Star Trek" without Dr. McCoy. Unfortunately, for giving the world such an endearing and enduring character, Kelley paid the highest price an actor can pay. Like most of his costars, he was typecast. Ironically, the young DeForest Kelley didn't want to be an actor. Instead, Kelley, born on Jan. 20, 1920, in Atlanta, wanted to be a doctor. But the Kelley family's financial situation ruled out medical school, and, while visiting an uncle in Long Beach, Calif., Kelley fell into acting. Soon, a talent scout for Paramount Pictures discovered him, and Paramount signed him to a contract after his return from World War II. Usually, Kelley played the heavy. He appeared as the black-hatted bad guy in numerous westerns, both on television and in the movies. 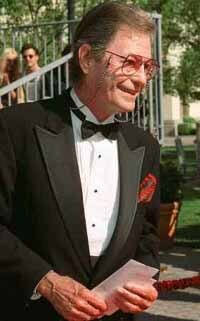 Actor DeForest Kelley arrives at the "Star Trek: 30 Years and Beyond," tribute at Paramount Studios in Los Angeles, Oct. 6, 1996, in this file photo. In 1957, he portrayed Morgan Earp in "Gunfight at the OK Corral," which starred Burt Lancaster and Kirk Douglas. Eventually, it all led to Roddenberry's casting Kelley as the chief medical officer on the starship Enterprise. Kelley might not be a doctor, but he would play one on TV. And he would play one in the movies as well, starring in the first six Trek feature films. The irascible Dr. McCoy, of course, always got all the best lines. Sure, there are Spock's "Live long and prosper" and Kirk's "Beam me up, Scotty" (which Kirk never actually said), but they can't touch "I'm a doctor, not a bricklayer!" or McCoy's deadpan "He's dead, Jim." Kelley once joked that "He's dead, Jim" would probably be engraved on his tombstone. Now, though, the joke has lost much of its humor. With his fictional death in "Star Trek: Generations," Capt. Kirk passed the torch to the new generation of Star Trekkers. The silver screen now belongs to Capt. Picard and crew. With Kelley and his alter ego gone, it's just as well. Kelley is survived by his wife of 55 years, Carolyn.